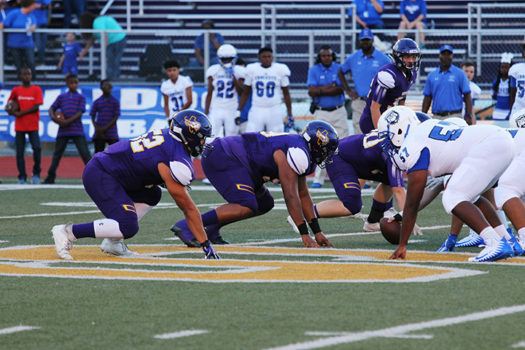 The Bison defense lines up to keep the Crockett team out of the end zone. As this year’s football season is coming to a start, and with already a win against Crockett, much of the success is given credited to all the new football staff . The football team has received a total of six new football coaches, each ready to accomplish goals for this football season. The new athletic director and head football coach is Coach Houston, who previously taught and coached at Rockdale High School, where they won the 2017 football state championship. He is helping the boys to adjust to his coaching strategies. Houston is known for helping win more than 70% of games during his football coaching career and plans to help this year’s team make it farther than before. Coach Roger Masters taught and coached at Rock Springs high school and is now the new defensive coordinator. Masters claims that his biggest goal for the defense this year is to shut everyone out, to win. The district has also received a first year coach, Coach Charles Carr who is the defense of line football coach. Although it is his first year coaching, Carr has already noticed some star players in the defense of line. The new offense coach is coach Paul Heintze, who focuses on the receivers and tight end players. It is Heintze’s first year ever coaching and he said that he has already noticed some key leaders and players in the defense. Coach James Ehlert previously coached at Navasota High School, and is now the assistant football coach with his primary focus on the defense’s outside linebackers. Coach Mark Martin previously coached at the college level for Western Kentucky and Texas A&M. He coached high school before and decided to go back to coaching high school in order to spend more time with his family. His primary focus is coaching the inside linebackers. The new staff members are getting adjusted and proud to see the success that many of the guys have already received.